Mamie Eisenhower loved the color pink. Her evening gowns were frequently made in various shades of pink for her. Her move to the White House was no different. In fact, so much pink was used in the private living quarters that the press took to calling the White House "the pink palace". 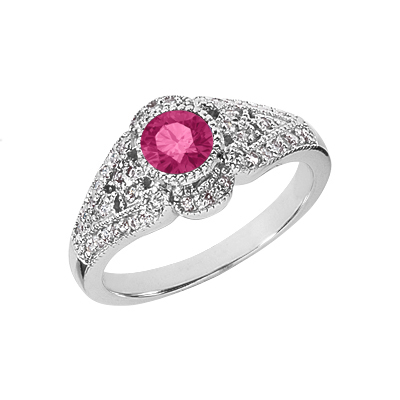 Any woman would feel like the "first lady" if she opens a box that has this beautiful pink topaz and diamond ring. The ring is set in 14k white gold and the center stone measures 4mm. There are 42 white diamonds set into the band to make the center stone stand out even more. We guarantee our 14K White Gold Diamond and Pink Topaz Art Deco Design Ring to be high quality, authentic jewelry, as described above.